Home Loss Prevention Would a Lost-and-Found Program Audit Find These Red Flags? Would a Lost-and-Found Program Audit Find These Red Flags? Some 43.8 percent of loss prevention departments operate a lost-and-found program, according to a survey of 238 executives by SDR/LPM in 2012. Any mishandling or theft of found property while under LP’s control is sure to give the department a black eye and reflect poorly on those in charge. What does it take to avoid that embarrassment? Tight controls that quickly raise red flags of wrongdoing are critical. Loss prevention staff members often have access to many assets, including found property, so conducting complete personnel screening and hiring honest officers is an important first step. But a retailer can’t put blind faith in individuals in charge of valuables regardless of its background check process. It needs layers of security in case a bad apple is in the batch. Case in point: In Orange County, CA, prosecutors charged a security officer with grand theft and commercial burglary for his scheme to steal money and other items from the lost and found of the Surf and Sand Resort, a luxury hotel in Laguna Beach. The officer was a 21-year veteran of the Los Angeles Police Department moonlighting as a security guard. As part of his job, the officer had access to the hotel’s computerized lost-and-found system, and he allegedly accessed the system and changed a record showing that hotel staff had found $2,000 in a hotel room. He changed the room number and the item description to a gold watch; then falsified that the watch was returned to its owner. He then stole money from the safe, according to authorities. A surveillance camera in the hotel’s security office where the lost-and-found safe was located aided the arrest. Is the answer to simply refuse to operate a lost-and-found program? Not necessarily, as such a decision can frustrate shoppers and may not eliminate bad press. For example, on Dec. 9, 2016, the news agency MassLive reported that a Worcester couple tried to turn in a found cell phone to a Walgreens employee but were told the store did not operate a lost-and-found program. After the couple went home with the phone, two men broke in their house, one brandishing a machete, to retrieve it. It’s instructive to look at an actual program audit to understand problems that can plague a lost-and-found program. Several years ago, a change purse containing cash and credit cards was found at UCLA Health System and accepted into the lost-and-found system operated by its security department. When the property owner came to claim the item, it had mysteriously disappeared from the security department safe. Administration subsequently called for an audit of the system, which took in an average of sixteen items per week, from cell phones to sunglasses. The audit’s recommendations provide real-world best practices for retail loss prevention professionals to consider. First, minimize access to found property. UCLA’s security department safe had dual-locking capability, meant to require two employees to jointly open it. Security office staff had one key, and security supervisors the other. But the review discovered that poor key control had resulted in a training coordinator/supervisor obtaining both keys, and that he accessed the safe without another employee present. Require dual-controlled access for the assignment of backup keys, so more than one employee is present for access to a backup key box. 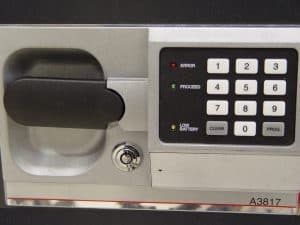 Just as a safe should require dual-access controls, dual-access controls should be placed on access to the safe’s backup keys. Implement a key control log to maintain accountability over access to the found property storage facilities. Change keys to the security department safe whenever individuals who have had access leave the department. Secure all found items in locked receptacles. The audit found that some valuables were placed in the security department safe–but others were placed in desk drawers, and large items were stored in an open, back-office cubicle, neither of which were secured. Tag and secure found items in zippered plastic bags or envelopes to keep contents intact. The program review found that found items were neither consistently labeled nor protected before being dropped into the safe or placed in storage drawers. These steps are crucial. Affix a date sticker—and other identifier, in case more than one item is found on a given day—to all found items before they are placed in storage. A data field to record the name and phone number of the finder. A detailed description of items and/or inventory of contents. Date of receipt of property. Area to indicate when items are placed in the safe. Area for LP staff to record dates and times that they attempt to contact property owner if information is available. The property owner’s phone number and date the property was released. Require property owners to sign the log when claiming their items(s). Require any transfer of found items to require a signature on the log, including if the item is removed for disposal. Periodically review logs to ensure that found property is recorded per policy. Maintain lost-and-found program logs and copies of property transfer lists for two years from the date the item was found. Maintain the logbook for found property in a secure area separate from where property is stored, so as to ensure records remain available in the event of unauthorized access to the property. On a surprise basis, reconcile lost-and-found inventory to the lost-and-found log. Don’t allow a backlog of found property to accumulate. Unclaimed found property should be dealt with according to policy, typically after ninety days. Periodically ensure that procedures and instructions for processing found property are not outdated and that they reflect current operating procedures and requirements. For example, don’t allow security procedures to call for daily transfer of property from customer service to the loss prevention office if transfers actually occur on a weekly basis. This post was originally published in 2017 and was updated July 11, 2018. College Admissions Scammers: Scumbags or Science?